Drape your dapper dog in designer duds from Yana Syrkin’s lush Fifi & Romeo pet boutique on Beverly Boulevard. Yana is known throughout the industry as the “Coco Chanel of pet couture” and the title is thoroughly apropos. Her trendsetting clientele includes Oprah Winfrey, Cameron Diaz, Ellen DeGeneres, Robert Downey, Jr., Angelina Jolie, Betty White, Jennifer Lawrence, Christina Aguilera and HRH Prince Charles, to name just a few. The opulent little shop features handmade, one-of-a-kind cashmere clothes and custom Italian leather accessories. There’s also a luxury home line featuring cashmere pillows, bed throws and travel blankets. For all you proud parents who love to dress your fur-babies in froufrou finery, Fifi & Romeo is your paradise. 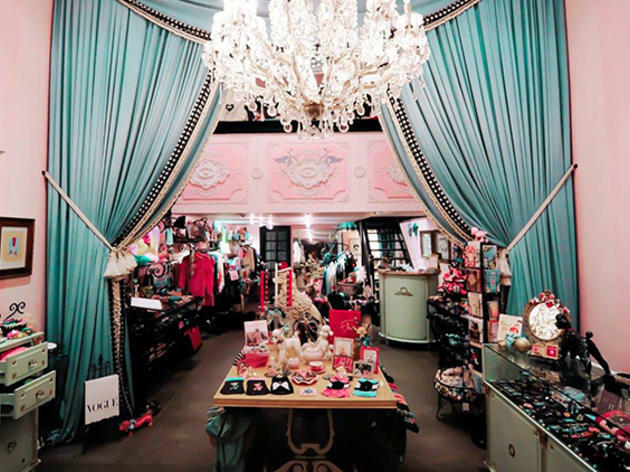 And if you happen to find yourself in Tokyo and are in need of a Fifi & Romeo fix, the Tokyo flagship opened on Valentine’s Day 2014. The Disneyland of Beverly Hills for your pets & the rest of your family. Only the finest recycled cashmere custom handmade goods!! !